Yes, I cried during Obama's speech. I actually also got up and danced around the room at 11 when CNN called the election. I'm sure I'll be jaded and cynical about the whole thing in no time, but I was definitely pinching myself in thrilled disbelief that night, and I even wore a sparkly sequined blue skirt and red sweater the next day (for real). 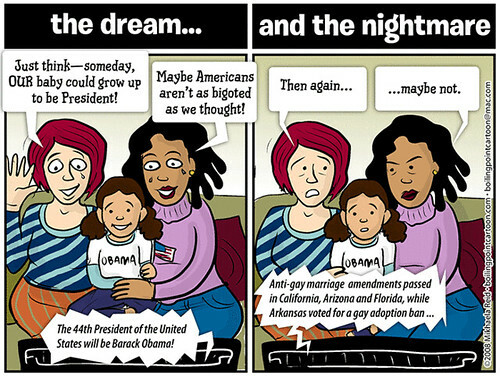 By the way, this is of course the same couple I drew reacting to Obama's likely nomination back in June. They were pretty psyched at the time about the possibility of marriage equality in California, but that dream is now deferred (hell, STOLEN), thanks to the efforts of some well-funded bigots. P.S. No, Obama's election does NOT prove that racism is dead. And I'm kinda annoyed with the editorial cartoonists who never draw anyone of color in their cartoons EVER unless the cartoon is about race who are suddenly drawing touchy-feely multicultural cartoons where black parents tell their kids that they too can grow up to be president, etc. Seriously--if you only ever draw white people as the "everyday" Americans reacting to the news, you're just part of the freakin' problem. Also, I just don't want to see a single other editorial cartoon involving the goddamn Lincoln memorial. Pffft! Lincoln Memorial...good one...we all know Lincoln didn't really free the slaves...the slaves freed themselves. Then look what happened after them getting themselves free. Also, I just don't want to see a single other editorial cartoon involving the goddamn Lincoln memorial. THANK YOU. For a guy who once said, "I will say then, that I am not nor have ever been in favor of bringing about in any way, the social and political equality of the white and black races, that I am not, nor have I ever been in favor of making voters of the negroes, or jurors, or qualifying them to hold office, or having them to marry with white people...there must be the position of superior and inferior, that I as much as any other man am in favor of the superior position being assigned to the white man," he's sure getting a lot of ink. Well, I offer my congratulations to all the Obama supporters. Your guy did it. I wish Barack the best of luck as president. However, I'm reserving judgement until after he takes office and implements some policies. But even though he wasn't my first choice, I still figure he'll be better than Oldy McOlderton and Danielle Boone the wild frontierswoman. "You rat bastards don't deserve a Libertarian president. Cheat, cheat, never beat. Liar, liar, pants on fire. You should all choke on your own vomit... better yet, choke on someone else's vomit and die. I think you should be pigs cursed for a million years." Good news today about definite policy changes on stem-cell research and the redneck "drill drill drill" approach to tackle energy needs ..part of a pre-emptive strike to reverse anything that Bush does in the next couple of months?